Discover 29 Fun and Effective Drills For Developing An Unstoppable Pitcher! Introducing the fastest, easiest way to build rock-solid mechanics, pinpoint control and jaw-dropping velocity in ANY pitcher! Have you ever heard the saying? "Good pitching beats good hitting"
It's gotta be one of the truest, most time-tested "laws" of sports ever spoken. Whether you coach baseball or softball, Little Leaguers or Div. I superstars, pitchers are absolutely critical to the outcome of a game. And when it comes to youth and high school softball, the pitcher's role is TWICE as important. A good young pitcher - a kid who can consistently locate her fastball and put some mustard on it - will dominate the game. But a poorly trained pitcher - a kid with bad mechanics who can't throw strikes - will murder your team's chances of winning, and take all the fun out of the game. There's nothing worse than watching your pitcher struggle on the mound, throwing wild pitch after wild pitch and sending your catcher scurrying to the backstop. Giving up walk after walk, while your opponent parades one baserunner after another around the diamond and to home plate. But here's the thing. If you're having a hard time teaching pitching mechanics to your players... spotting and correcting mistakes... or finding drills that reinforce the proper fundamentals. And it's not your pitcher's fault either. Most amateur coaches have only a vague idea on how to teach this difficult skill. And with all the different opinions on the "right technique" for developing proper windmill pitching mechanics, it's almost impossible to figure out on your own. Your pitchers are desperate to improve and need your help. And your competition is ready to jump all over your weak pitchers and embarrass your team if you give them the chance. The good news is - learning the art and science of pitching isn't as hard as it looks. With the right drills and some consistent workouts, even the rawest beginner can develop the proper mechanics, learn to consistently fire strikes with precise command and control, and become a dominant force on the pitcher's mound. But - like most "real" coaches in the trenches - you don't have time to read through dusty old textbooks on the "Science of Pitching," or attend some overpriced coaching clinic halfway across the state. Read this simple report that reveals exactly what drills to use in practice. - so you can unlock the secrets to better pitching, and give you the knowledge and confidence of a pro! "Ultimate Softball Pitching Drills" takes all the guesswork out of coaching pitchers by giving you a clear and logical training routine. You'll get fast results with any pitcher and any level, from Little League to high school and beyond. 10 mechanical drills to help you install and reinforce the basic fundamentals of the windmill pitching motion... from grip, to stance, to stride, arm circle, release and follow through. 3 control drills that train your pitcher to locate her fastball, changeup and breaking pitches with pinpoint accuracy! 5 velocity drills to generate more power from the lower body, and a more explosive arm whip... for a blazing fastball that's practically unhittable! 4 mental training drills that train your pitcher to increase focus, shrug off pressure, and perform her very best against live competition! 4 dynamic conditioning drills that quickly improve your pitcher's endurance, while keeping her safe and injury free for the entire season! 3 troubleshooting drills to spot and correct the most common mechanical errors that sabotage a pitcher's effectiveness. Sure, we've been working with pitchers and "coaching coaches" for a long time - but we still consulted EVERY pitching expert we knew before developing this step by step system, then personally tried and tested dozens of different pitching drills with our own players. Many of the drills are based on the unique teaching methods of softball pitching legend, Dee Dee Weiman. At UCLA, Dee Dee achieved first team All American status as a pitcher, guiding the Bruins to two national championships. Over her incredible career, she racked up a 59-13 record, with a lifetime 0.79 ERA and 16 career no hitters. Her single season record of 10.4 strikeouts per seven innings STILL stands as an NCAA record, more than 20 years after her retirement. Today, she's an associate head coach at Div. I powerhouse Cal State Fullerton, and one of the most respected pitching coaches on the planet. This system is jam-packed with PROVEN drills and techniques that work for ages and competitive levels. And the drills are simple, straightforward and FAST to learn, so you can start using them at your very next practice (tonight if you want). Don't let the size of this short report fool you. Over 100 hours of research (and many thousands of dollars) went into this project. I've pulled together in one simple collection the most essential drills you need, to develop safe, consistent, and repeatable pitching mechanics. So your girls can throw harder, more accurately, and with more confidence than they've ever had before! You can use these drills to evaluate your potential pitchers. To develop and maintain proper mechanics throughout the season. To master new types of pitches. To spot and correct mechanical mistakes... the possibilities are endless. Karate Kid Drill: An awesome drill that trains your pitcher to recruit more power from the push-off foot and drive through the hips, for an explosive, blazing fastball that's practically unhittable! Four Corners Drill: Trains your pitcher to locate her fastball to all the "tough to hit" areas of the strike zone. Master this one technique and hitters won't stand a chance! Walk Through Drill: My #1 favorite warm-up for practices and games. Rapidly builds confidence, while getting your pitcher into a comfortable rhythm. A unique "pitcher-specific" conditioning drill that strengthens the entire "kinetic chain" - from the stride and push-off foot, to the core, upper body, shoulder, arm and wrist. Everything is distilled down and explained in the simplest way possible, with step by step instructions, full-color photos, and useful coaching tips. So you can learn these drills today and start using them tomorrow, even if you've never coached pitchers before. These aren't your run of the mill "summer softball camp" drills either. Each one is fun, original, and creative... supported by the latest biomechanical research and proven to work with players at all levels. The confidence you'll feel, walking onto the field at your next practice, armed with an arsenal of creative pitching drills your players will love. The fun and satisfaction you'll experience, watching your hitters rapidly improve, making better contact, getting more base-hits, and earning more wins for your team! Listen, I know that coaching youth softball is loads of fun, but it's a lot of work too. And I've devoted my life to helping folks like you save time and energy, while experiencing more success with their teams. $7 puts the eBook within reach for the vast majority of people. It's not expensive for even the humblest beginner. So if you're serious about becoming a better coach, and if you would like to instantly have a proven plan to develop top-notch pitching skills, click the Add to Cart button below now. Guarantee #1 - If for any reason, you think this eBook isn't the best $7 you've ever spent, just send me an email within 60 days of purchase and I'll gladly refund you the whole 7 dollars. Guarantee #2 - If you actually follow these drills in practice and don't see an immediate improvement in the way your players pitch, I'll actually refund TWICE your money. All I ask is that you give me an honest effort. But don't be fooled. 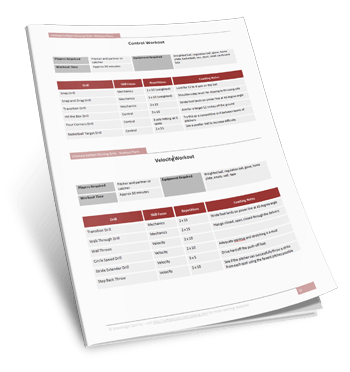 There's more real, actionable information jammed into this report, than you'll get reading a dozen books. And, to make sure you really hit the ground running, I'm also going to give you these two free bonuses valued at $19.90! The perfect addition to your coaching binder. 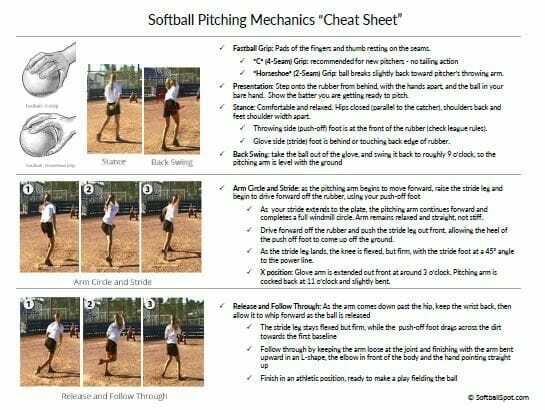 This printable cheat sheet breaks down the 5 phases of the windmill pitching motion with step by step instructions and coaching tips. We really want you and you pitchers to use this system so you can experience the most dramatic improvements in the shortest time possible. In all, you're getting 29 amazingly effective drills and dozens of key coaching pointers worth their weight in gold. Plus, 12 step by step workout plans you can start using immediately. I'm Offering Special Pricing Today To Help You Jumpstart Your Season! Time is very much "of the essence." If you want to develop a dominant pitching staff this season, you need to start right now. This eBook is so essential I'm practically giving it away because I want to make sure you take the simple steps to becoming a master pitching coach, and start seeing the results right away. Click the Add to Cart button below to get instant access to "Ultimate Softball Pitching Drills" Risk Free for just $7. YES, I want in! I want access to your "Ultimate Softball Pitching Drills" eBook, plus the Cheat Sheet and Workout Plans. Please give me INSTANT access to this step by step training system right now! I've already done the research... spent the time filtering out what doesn't work… and compiling it all into this incredible "best of" pitching drill collection. There's no need to waste your time searching the web for unproven ideas, or spend hundreds of dollars on coaching clinics. 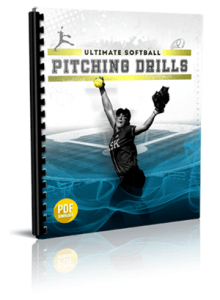 Just download "Ultimate Softball Pitching Drills" and you'll get instant access to a complete training system you can start using today! 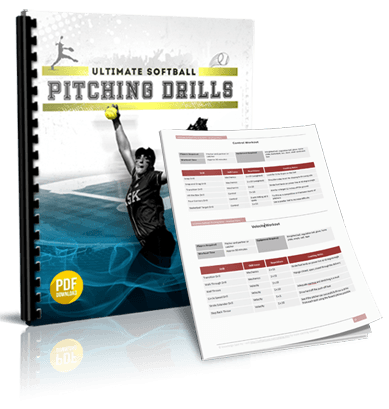 Click here to get instant access to Ultimate Softball Pitching Drills now for just $7!